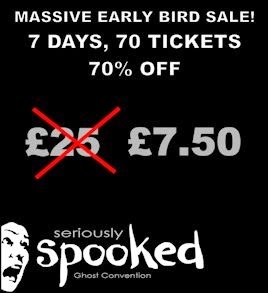 If you book quickly, you can get an early bird ticket for £7.50 for Seriously Spooked, the Association for the Scientific Study of Anomalous Phenomena (ASSAP)'s one-day convention about ghosts that is taking place in Aston University on 27 September. Normal ticket price is £25. Seriously Spooked should be a fascinating event for anyone interested in what ghost experiences are and how they are investigated. Ghosts have fascinated mankind for centuries. Answering those age old questions of what happens after death - and why do people have unusual experiences - have pre-occupied academics since Victorian times and a generation of paranormal investigators today. Seriously Spooked: Ghost Convention brings together 10 of the most respected ghost researchers today to answer the questions: what are ghosts? And how do we study them? The special Discount week starts from Saturday when Seriously Strange hits the doorsteps, but our e-journal subscribers get a chance to book even earlier! Book now and take advantage of this massive early bird discount! Here is a partial programme. More speakers to be announced soon! Ann Winsper: Paranormal Investigation: Does it help us understand ghosts!? CJ: Haunted: Dead or Alive - the biggest question of all. Dr. Hannah Gilbert: The experience of malevolent ghosts and their social function. Jack Hunter: Animist and ghosts across different cultures in the world. Paul Hobday: Do Paranormal TV and events help or hinder ghost research?